I tried a few night shots. 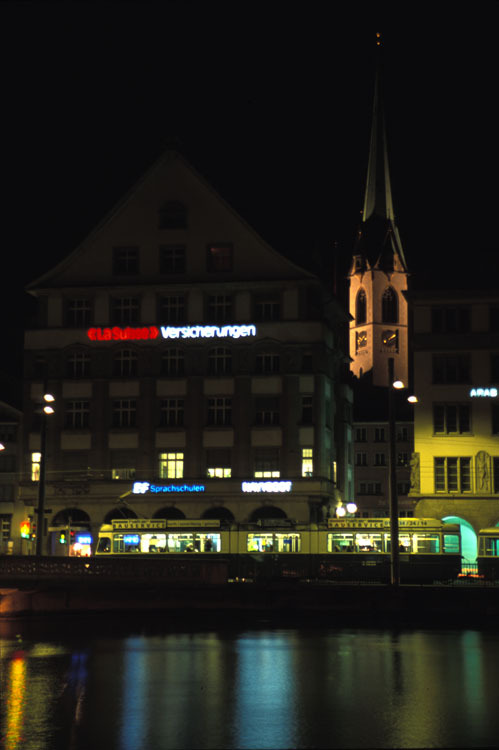 Zurich is not overly-lit like most American cities, so the long exposure required for any detail in the church steeple meant that the light from all the neon lights and the stop light on the left bled into adjacent areas of the film, leaving them looking a bit blurry while the buildings are sharp. Suprisingly, the tram did not move during the entire exposure. I had watched the signal for a long while to get the timing right, but then there was a bit of a traffic jam right when I took the picture which prevented the tram from moving.